The Commercial Electric 4 inch Recessed Light Kit includes a IC remodel housing and White Trim that gives R20/50Watt equivalent light output-77% energy consumption saving. Compatible with dimmer switch for different illumination needs and increased energy saving. ENERGY STAR certified. Reduce energy consumption to 11.7 watt LED - comparable to R20/50 watt incandescent bulb. Adjustable tilt light up any desired focal point of the room. 50 Watt bulb equivalent light output - 11.7 Watt energy used. Save on bulb replacement up to 60,000 hours lamp life. The Conversion Kit finished in white, allows you the flexibility to convert older 6 In. cans to halogen lights. Complete kit with gimbal style trim. Front relamping, 1 x 50W GU10 bulb required. Feit Electric introduces the new InstaTrim LED which includes energy efficient LEDs and a built in modern trim to help you convert all of your 4 in. recessed cans. This InstaTrim LED saves you time and money by lasting 25 times longer than your standard incandescent and by consuming 81% less energy. With its innovative InstaTrim design this 4 in. LED fits most 4 in. recessed cans with medium base sockets and provides a flush finish against most surfaces. This 4 in. LED is suitable for both indoor and outdoor applications, features full range dimming from 10 to 100% and produces the same amount of light as its incandescent counterpart. Globe Electric 90014 4 Inch Swivel Recessed Lighting Kit, Antique Brass Finish. Adjustable swivel feature to direct light where needed based on your desired preference. Full kit including: trim, housing/can, patented clip system and electrical box. Quick and Easy Installation: includes extra-wide, patented clips that grip uneven holes and surfaces to secure effortlessly into position. Superior fit for a smarter, faster installation. Creates mood lighting and dramatic effects to highlight decorative elements, ideal for use in living rooms, bedrooms and dining rooms. Requires one MR16 GU10 Base 50W bulb (sold separately). 5 year limited product warranty. 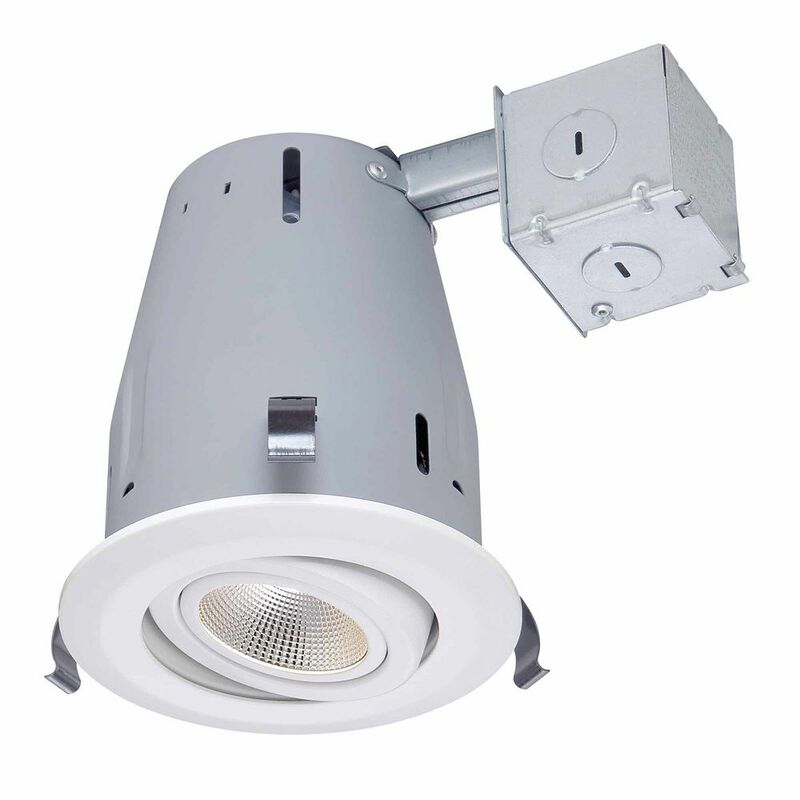 4-inch LED IC Recessed Gimbal Lighting Kit in White - ENERGY STAR® The Commercial Electric 4 inch Recessed Light Kit includes a IC remodel housing and White Trim that gives R20/50Watt equivalent light output-77% energy consumption saving. Compatible with dimmer switch for different illumination needs and increased energy saving. ENERGY STAR certified. Reduce energy consumption to 11.7 watt LED - comparable to R20/50 watt incandescent bulb. Adjustable tilt light up any desired focal point of the room.